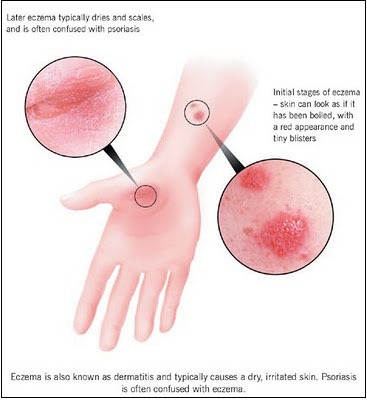 Eczema is an umbrella term used to denote a group of skin diseases which are characterized by inflammation. 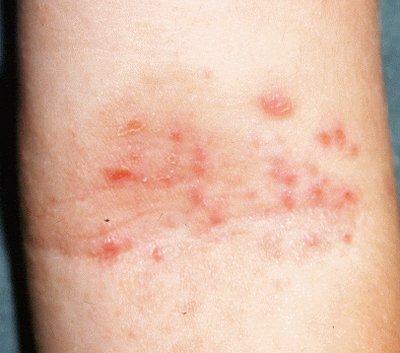 The most common among them is known as Atopic dermatitis. Atopic implies an allergy which has been passed on from generation to generation and dermatitis suggests inflammation of the skin. If you are someone suffering from eczema, you are sure to feel frustrated until such a time that an almost permanent solution is sought out. The constant itching would deprive you of your sleep. You would even be forced to absent yourself from social gatherings. Affecting even your professional life is sure. If it affects children, they would be forced to stay away from school and even friends. If you are a parent, you are sure to have a tough time helping your child cope up with the situation. And, studies show that more than 14 million Americans are the victims of this disease and the majority of them are children. Eczema generally affects persons with a history of some allergy like asthma. And, it is has been determined that most of the sufferers develop this disease before the age of 5. It appears in the form of rashes on the face, scalp, feet, and children’s hands. Following are the Eczema symptoms which differentiates this disease from others of the kind. Patches which would create trouble with persistent itching. The cause of this disease remains unknown to medical science even at present. However, doctors are sure of one thing, atopic dermatitis; the most common among these diseases is not a skin allergy. The patches may resemble in appearance to that of an allergy. Following are considered to be the possible risk factors of this disease. Following are the other types of eczema besides atopic dermatitis. You may develop this disease if your skin is sensitive and comes into contact with general allergens. The risk factors may include perfumes Nickel and hair dye. This disease affects those persons whose skin constantly comes into contact with those substances which are harmful to it. The irritants can be anything, ranging from detergents to products used for cleaning a floor. This is a disease which is considered to be the result of some defect in a person’s immune system. It starts reacting to a yeast called Malassezia. And, it affects the hairy and oily parts of your body like eyebrows, chest, and scalp. The only symptom is inflammation in the affected area. People may not even notice this disease because it does not create much trouble. The reason for this disease remains a mystery even today. It is known to be the most difficult to treat. If you are a person suffering from this type of eczema, the patches on your skin would be in the shape of a disc. And, it can affect people of any age. Treatment is generally based on eczema symptoms you are suffering from. The doctor may require information about the patient’s medical history and any allergy he/she may be suffering from. Most of the time, it would be handled by your general practitioner. However, he/she may refer you to a dermatologist if things go beyond control. Getting permanent relief from eczema symptoms may not be an easy job. However, preparing a diary of triggers and avoiding the same would be of great help to you.